HAWAII Vancouver Bulls and More - Hunting Hawaii! We are your guide to hunting and fishing adventure worlwide: Hawaii, Argentina, Africa, South America, Australia. HAWAII VANCOUVER BULLS AND MORE! Most do not think of Hawaii as a hunting destination. Simply not true! EAI Outdoors has been working with local landowners to produce some of the most interesting and unique hunts you will ever go on. These hunts make a great winter vacation and can be combined with world class fishing for Marlin, Mahi Mahi and others, all while the family enjoys time at the beach! 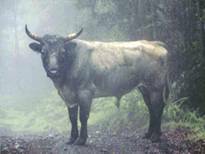 Vancouver bulls are wild cattle found on the big island. Dangerous and mad dog mean these animals only look like cows! They will charge instead of run away. This is a serious dangerous game hunt. Mouflon Sheep: Hawaii is home to purebred European Mouflon. These are true free range animals. 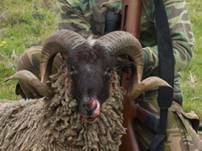 Corsican Ram: Also free range and found in big herds. One of the toughest animals to approach. Game Bird Package: (3 Erkels Francolin, 3 Kalij Pheasants) Two very unique species! Rio Grande Turkey: The Big Island is over run with turkeys! Spring season is mid-March through April. 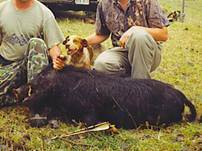 Wild Boar with Dogs: Special!!! $550 for day hunt with one boar included! We are over run! Help!